Enjoy Hostel is ideally located in the residential district of Montparnasse, 14th arrondissement of Paris. 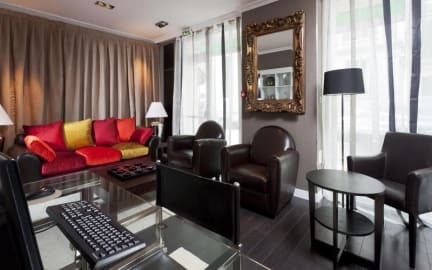 The Hostel is located in a lively district, perfect for those who want to be fully emerged in the Parisian life style. The property offers 24-hour reception and en-suite rooms with free Wi-Fi access. Three computers are available. A buffet breakfast is available daily in Enjoy Hostel’s modern and newly renovated dining room. There is also a fully equipped kitchen at the property. Guests have access to a lounge. Enjoy Hostel offers comfortable private and shared rooms. A flat-screen TV with satellite channels and a work desk are provided in each bright and airy guest room. Private bathrooms are equipped with a hairdryer. The property is air-conditioned. The property offers shared rooms for 4 or 8 guests, rates between 19 to 35 euros, depending on the season. Private rooms for two people are composed by double beds or twin beds. For more information, please do not hesitate to contact the property. Please note that towels are available to rent for 1.80 euros. There is a mandatory 8 euros refundable deposit for Linen - Please note that towels are available to rent for 2.50 euros.